Dr. Patel first developed an interest in endocrinology while a graduate student at Boston University School of Medicine, where he completed his graduate thesis exploring the biochemical pathways that lead to abnormal insulin secretion in diabetics. He chose to pursue a fellowship in endocrinology at the Charles Drew University School of Medicine (affiliated with UCLA) in Los Angeles where he engaged in academic and clinical endocrinology. 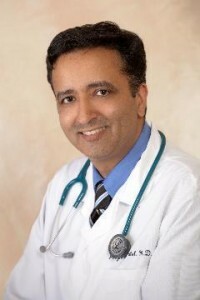 He is now double board certified in Internal Medicine and Diabetes, Endocrinology, and Metabolism. He had been on staff at Kaiser Permanente in Riverside, California and was in private practice in Stony Brook, New York. He joined Springhill Medical Group in July of 2011. Dr. Patel has a clinical interest in diabetes as well as thyroid, parathyroid, pituitary and all other endocrine disorders. Dr Patel’s practice is open to new patients. For insurance plans that require a referral, appointments will be made upon referral from the Primary care physician.